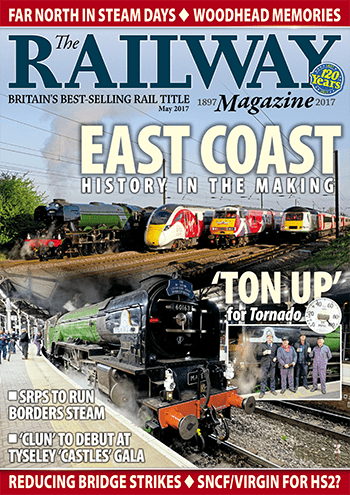 Tornado becomes first 100mph British steam loco for 50 years; ECML ‘Four Trains’ event draws the crowds; Settle-Carlisle line reopens after 13 months of repairs; Clun Castle to debut at Tyseley’s June open day. Swanage Bulleid gala smashes visitor records, Midland Railway ‘Picnic Saloon’ restored after 60 years, ‘Scotsman’s’ Worth Valley visit a ‘big success’, NRM gifts LSWR Adams 4-4-0 to Swanage Railway, ‘S160’ and ‘A4’ to visit Mid-Norfolk; Two Bulleids for GCR autumn gala. Easter blockades deliver £70m of work at 200 sites, TfL publishes £3.6bn infrastructure ‘wish list’, Low Moor and Ilkeston stations open for business, user group lobbies for Ashchurch improvements. Ex-Buxton Class 37/5 moves into preservation at the Mid-Norfolk, Sunderland port shunters saved, Class 88 booked for Severn Valley diesel gala, first Bluebell visit for a Class 50, PWM650 moves to HST at Rowsley. 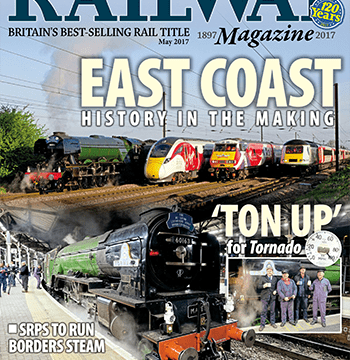 The Railway Magazine for only £20 per year. Prize Crossword and Where Is It? Previous Post:IN THE MAY 2017 ISSUE – ON SALE NOW!